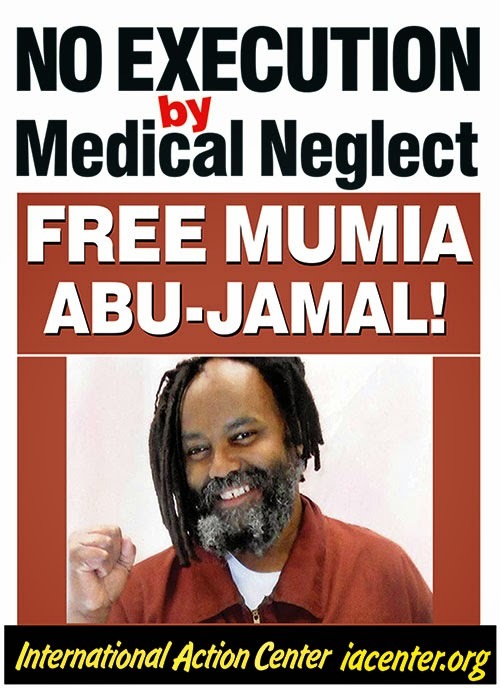 Houstonians will gather at the Mickey Leland Federal Building, 1919 Smith Street, for a press conference at 5:00 p.m. on Monday April 13, to highlight the critical health crisis of political prisoner Mumia Abu-Jamal. Abu-Jamal is an internationally celebrated African American writer and radio journalist. He is the author of six books and hundreds of columns and articles. He is a former member of the Black Panther Party and a supporter of the MOVE organization who has spent the last 30 years in prison, almost all of it in solitary confinement on Pennsylvania’s death row. Abu-Jamal was tried, convicted and sentenced to death in 1982 for the murder of Philadelphia police officer Daniel Faulkner, an incident which took place on December 9, 1981. Following the October, 2011 Supreme Court ruling that vacated his death sentence, Abu-Jamal was put into the general prison population in January 2012. In January of this year, Abu-Jamal asked for treatment for an increasingly serious skin problem that spread over his entire body. He was treated with antibiotics and steroids which caused a severe allergic reaction. He was admitted to the infirmary. On February 17 Mumia weighed 268 pounds. When he was discharged from the infirmary a week later he had lost over twenty pounds. On March 30, when he was taken to the hospital in a diabetic shock with his blood sugar at almost 800, his weight had dropped to 184 pounds. Minister Louis Farrakhan exposes America's wicked foreign policies: "Be Careful How You're Handling North Korea"